Under the bright light of her fullness, let’s open our hearts in communty to all that is wanting to be seen and felt within. Under the bright light of her fullness at the magical Maison Medley in Topanga, we will open our hearts in community to all the fullness within that is wanting to be seen and felt. (I really can’t describe with words the beauty of the full moon as it rises over the mountain range from our back deck). 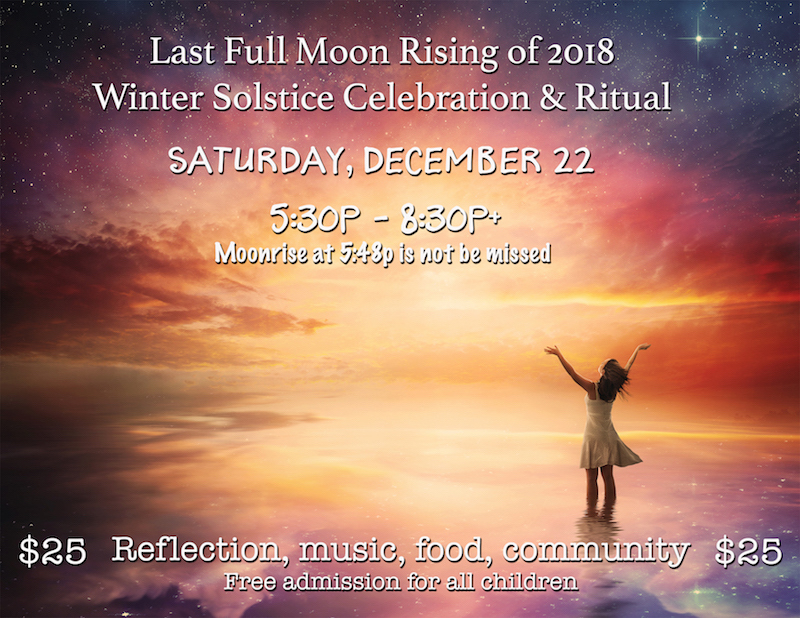 Engage in a solstice tradition of bell ringing in community to welcome the longest night of the year and the turning within that this time invites us to. There may be one other surprise solstice tradition. Prepare for 2019 by connecting to your intuition and inner knowing through a brief guided practice. This will be something you can turn to again and again to find and lock onto what’s true for you. No event is complete without music! We will make merry and sing and dance! All musicians are welcome to come and share!